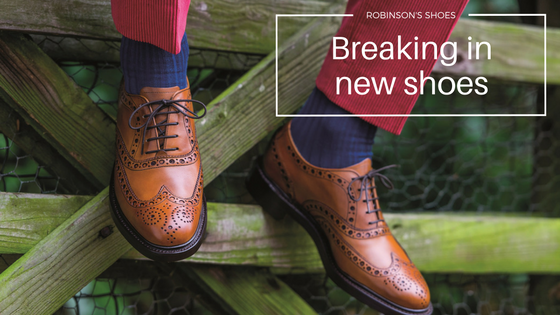 At Robinson’s Shoes, we think new shoes should fit like a glove from the start, but sometimes that just isn’t the case when you buy shoes without being properly measured. Are your new shoes feeling a little uncomfortable? Perhaps you need to spend some time breaking them in gently, so that you’ll get years of comfort from them. Here are the best ways to go about breaking in new shoes, so that your poor feet don’t suffer. Rome wasn’t built in a day as they say, so don’t try and break in your shoes by wearing them for a full day. Take your time and wear them for a few hours at a time initially, until your feet feel comfortable in them. When you’re not wearing them, make sure you use a shoe tree so that they keep their shape. You can wear them around the house, or to work if you’re sitting at a desk for the day – too much walking in them too soon will only end up giving you blisters. Did you know that you could be wearing shoes that are two sizes too big for you? Most men stick to the size they think they need rather than getting professionally measured, but finding your ideal fit will make breaking in new shoes a breeze, as they’ll already be comfortable. You also need to consider your ideal width too, as smaller, tighter shoes may feel uncomfortable and lead to friction on your feet. Find out more about our free personalised fitting service and see if you’re wearing the right size. Some people will take extreme measures when trying to make new shoes more comfortable, like bending the backs to ‘soften’ them, or spraying them with alcohol or water to mould them to their feet, or even wearing multiple pairs of socks to stretch them out. Don’t ruin your shoes by doing these! If you tried them on in the store and they weren’t comfortable then, they’ll not get any easier when you wear them in. Wear the socks you would normally wear and just take your time. If the worst should happen and your new shoes give your feet cause to break out in blisters, treat them properly and give the new shoes a rest for a while. Soak your feet in lukewarm water, and keep your raw skin moisturised and covered so that you don’t get it infected. Check out this article for more advice on treating blisters. If you wear the same pair of shoes every day, when you go to try a new pair they will automatically feel out of place. Try switching up your footwear routine so that your feet get comfortable in lots of different pairs of shoes. This will be great for your shoes too, as giving them a rest day will ensure they last for longer without the leather cracking or wearing out.